NVMe is quickly becoming the buzzword around the storage water cooler. Enthusiasts are excited and interested in building and upgrading their systems with latest generation drives like the Intel 750 series. 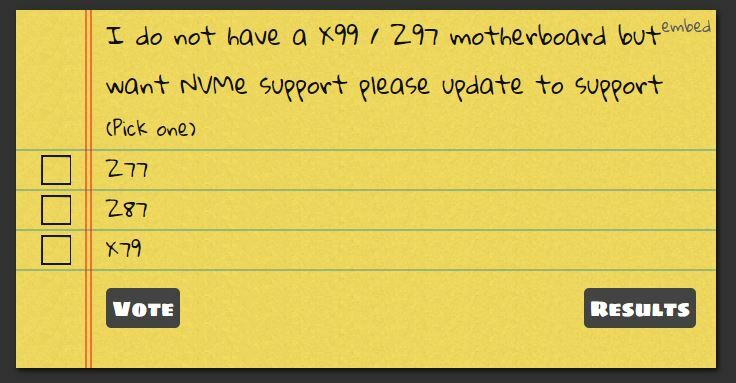 As of now officially only the Z97 chipset and X99 chipset offer support for NVMe. Internal testing has shown success though ( not validated ) with X79 and Z87. That being noted the ideal solution is formal UEFI releases offering support for NVMe. I have created a poll to allow you out there to voice your opinion and let ASUS R&D know that you want to have support for NVMe. So what do you need to do? Check out the poll below. Let your voices be heard if you want your chipset / motherboard to be supported.